Enjoy the extra space this condo has to offer and wide open floor plan. A nice ocean view greets you from the living room with an open kitchen layout. Charmingly decorated by its owners, you are sure to enjoy your days and nights here. The large picture window provides unobstructed views of the Pacific Ocean beyond and lounge chairs are on the balcony perfect for a morning cup of coffee, midday nap, or evening nightcap. Open the windows and let the sounds of the ocean lull you to sleep. A great time at the ocean! We always enjoy our stays in the condos at Vacations by the Sea. A couple of days at the ocean shore is good for one's soul. The condo is neat and tidy with a great vies of the shore. We had everything we needed for a relaxing weekend. Thanks for staying and hope to see you again soon! We had a fantastic time visiting Westport for the weekend and would recommend this property for anyone looking for a comfortable place to stay. The unit was clean, access was easy and we instantly felt right at home. The condo has a nice view from the living room. Close to the pool but not the beach. Kitchen has everything needed for cooking light for a couple of people. Could have done a better job cleaning the shower floor. Bathrobes were provided which was a thoughtful gesture. As always we enjoyed our stay at Vacations by the Sea condos. We return annually because we can depend on our unit to have everything that we need. Great ocean views and relaxing experience. We have stayed at VBTS many times. The closeness to the beach and the walking path are the main draws. The property itself is extremely well maintained and kept up. The rooms are always clean and ready when we get there. Most everything is within a couple miles of the condos which makes it convenient. Highly recommend booking a vacation at VBTS. Booked the unit for a last minute weekend with friends. We were pleasantly surprised by the spaciousness of the condo. It suited our needs perfectly. Thanks for staying and we're happy to hear you enjoyed the condo. This condo offers alot of room for a one bedroom being a corner condo, including an extra bathroom for guests in the hall. We have been going to this property for the past four Labor Day weekends, and as long as it stays as nice as it is we plan on many more years to come. Very nice property, and everyone enjoyed their stay. Wonderful time at the beach! The condo was very nice, roomy, well stocked,and had a beautiful view of the ocean. The blinds in the bedroom had black spots on them, might have been mold from the humidity. Other than that our stay was fantastic. Great condo for family and friends. We are think of returning to the condo next year. Oh the view was breathtaking. We walked the beach everyday and on our 2nd day a old fish boat went aground and we watched it slowly get consumed by the sea. I've stayed at Vacations by the Sea 8 times, 5 in this unit. It's very comfortable and clean, nice view, great beach access. I always love my time here and it's always too short! I stayed there for a couple of nights while I was working in the area. Very clean and quite place to stay. suggest a 2nd bed light for reading. Thanks for the great review and helpful suggestions. We'll try to get a 2nd reading light in the bedroom. See you again soon. Awesome as always - I booked online and the system changed the check in day (I was checking in the same day I made the reservation). Sent a note to the ladies in the office and it was changed pronto and I checked in that night with no cares. Just fabulous beach. Thank you soooo much for your excellent customer service. The unit was spacious and clean with a wonderful view of the ocean. My daughter and her friend had fun going to the beach, using the hot tub and they gym, and seeing the local sights in Westport. This is our 4th annual trip, and we had a great time. Great. Above and beyond what we expect . Very enjoyable view of ocean. The property was clean and well stocked with supplies. The weather was sunny to enjoy the surfing competition. The staff was very helpful in returning items left behind. Need to replace the can opener. Room was clean and ready. We chose the condo for our honeymoon, and were very pleased. The condo was well kept, and beautifully decorated. We were able to sit and watch TV together, sleep in, and walk on the beach, which were our priorities. I would most certainly recommend this location to friends! Thank you for choosing us for your honeymoon, we're thrilled to hear you enjoyed your stay and we wish you many years of happiness. Beautiful week on the ocean. This is about my 4th or 5th stay in this unit, and it's always clean and quiet and has everything I need for a great vacation! We rented 1 bdrm, 2 bath. Had a great living room area, balcony, & kitchen. It was great to have the beach, play ground, & pool all so close. My two little ones had a great time! Only issue was two of the pots in the kitchen were in rough shape- black specs coming off in the food. As soon as we called the management company, they replaced it immediately and were very helpful. Situation was handled in a great way. It was a nice stay. The carpet needs to be cleaned. Furniture and tv's were slightly dated, but unit was clean and otherwise great. The property/location and management staff is awesome. They were very helpful with a last minute booking and then flexible on a late check out. Noticed a broken rung on one of the kitchen counter stools. Came to Vacations by the Sea for my son's wedding. The unit was very well furnished and the robes on the bed were a nice touch. My husband and I enjoyed a great 3-day getaway at Westport and Vacations by the Sea was the best way to do so. Condo 221 was as decribed: super clean, convenient to all visited locations, and the property (which was located right by the beach) was outstanding in every way. We will definitely be back!! Thanks for staying and we'll check on the kitchen items you mentioned. Sometimes when we have a family or group stay in several condos plates, cups, silverware, and utensils can get moved over for a meal and not returned so we'll check the other condos in the building. See you again soon! A great stay to celebrate the bringing of a new year, especially with a razor clam tide and great weather to match. The property was very clean and cozy. My family had a wonderful stay and enjoyed our vacation. We will be coming back soon. Thank you. 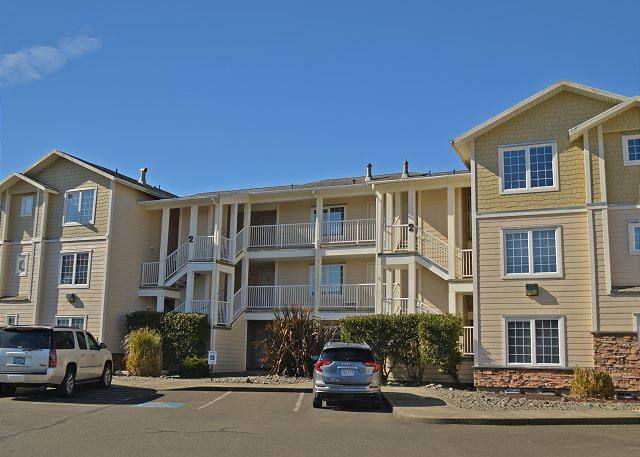 Westport condo - Fantastic value for the coast! The condo was very nice and clean. Excellent location for access to beach and away from the rest of the city. Overall and excellent experience, I can't wait to come back again! Jennifer S from Issaquah, Wa does not recommend this vacation rental. Great stay, very clean, the kind of quality we've come to expect from VBS. My only small complaints are: 1) The exhaust fan running constantly in the master bathroom created an annoying sound (like water pipes) throughout the stay and 2) the window shades in the master bedroom are not sufficiently dark enough to block out the outside property lights. If we ever stay there again we will have to bring sleep masks. Excellent spot for a quiet weekend. Very neat and clean, liked it very much, will stay there again. Outstanding, I loved it. Thank you. Thanks for staying and we are happy to hear you loved the condo. See you again soon. Beautiful area and beach. Easy access to beach and other interesting things to visit. Thanks for staying and I'm happy to hear your mate didn't get you down during your stay. Hope to see you again soon. Clean, light, airy, & spacious best describe this unit. The living room has a great view & looks straight out at the ocean across the dunes. Very nice property, friendly & helpful staff, nice amenities, comfortable unit, close walk on a nice trail through the dunes to the beach. We'll come again but might look for a unit that has a more direct orientation from the deck to the ocean. To see the ocean from this small deck and not so much of the bldg next door you have to position your chairs just right. The deck felt a little closed in for that reason & wasn't quite the "sit & soak up the ocean" atmosphere I was hoping for. That's the only thing I'd change about our short stay. We've stayed at several places in Westport and this is now our favorite, hands down, including the unit we were in. It's nicer than any other properties we've stayed in on the WA coast too. Absolutely perfect as advertised. Was larger than I was expecting, clean and comfertable. We have had 3 visits to your condos and have enjoyed each one very much.A nice relaxing few days at the beach. We had beautiful sunshine and my husband enjoyed surfing on his birthday. The condo was very kid friendly and my daughter had a blast.We look forward to our next visit. We came over for my husband's 45 birthday weekend. We were going to fish and relax, instead we just got to relax. We had a great view from the living room window and really enjoyed our time away. This is our 2nd stay at Vacations by the Sea and we plan to be back again this summer. Everything was outstanding: friendly and efficient welcome, incredible location, unit was spotless and had a wonderful view. Totally relaxing. Everything was wonderful in 221. Deck gets afternoon sun which is super. Would highly recommend it if you don't mind a double bed. What a pleasant surprise to find such a lovely place at the beach! So much room to move around and every amenity you would want. Very relaxing and a great place to come home to. Thank you for a wonderful stay. We will be back! I had a great time, nice and quiet and relaxing! I'd suggest maybe a little better reading light in the living room, the only improvement. We had a wonderful time.The amenities worked well for us. The condo was spotless and the beach accessibility was great. My daughter had fun at the beach and the playground. A very relaxing vacation and we look forward to coming back. This was the 3rd location that we stayed at Vacations by the Sea and proved to be our favorite. Great light, lower noise, best equipped and easiest to park and travel to hot tub. Our first two locations were more expensive (one on 3rd floor in building 8) but did not offer all the aspects that we appreciate. Only compliant was no blinds on the door to the deck which faces bldg. #1.